Home » 25 Days of Giving: Nectar Giveaway! 25 Days of Giving: Nectar Giveaway! Day 2 of 25 Days of Giving and we’re making sure another lucky winner gets a great night of sleep with a new Nectar mattress. If you’re in the market for a new memory foam mattress or hoping to give the gift of a great night of sleep this holiday season, be sure to enter for your chance to win! 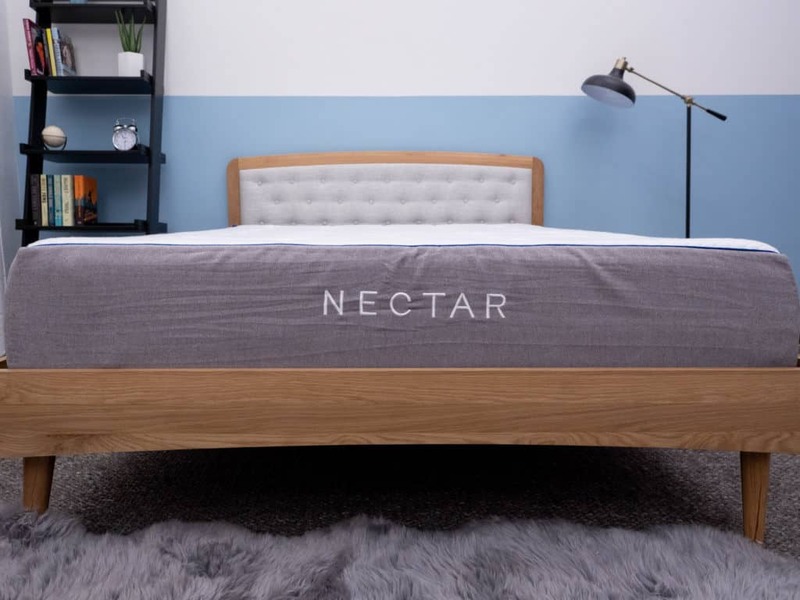 Nectar has quickly become one of the most popular bed in a box mattress brands out there and if you love the feeling of sinking into bed, you’ll quickly see why. The Nectar mattress uses multiple layers of memory foam to provide deep pressure relief. It’s a great mattress that we recommend for side sleepers and couples, you can learn more about it in our full Nectar mattress review! Check our giveaways page for a new giveaway everyday during 25 Days of Giving! 25 Days of Giving: Casper Giveaway! 25 Days of Giving: Saatva Mattress Giveaway! The Nectar is my favorite. All the mattresses sound great but the one that got my attention most is the Zenhaven. My back is begging me to get a new mattress and my wallet is like yeah buddy.. not happening~ lol… winning one would be amazinggg!!! Thanks for the chance! I liked the Zenhaven the best! The Nectar would sure be a great Christmas Gift! Thanks for the oppurtunity! I would have to go with the Purple..
All of them are soooo amazing! I can’t pick! My favorite Latex Mattress is the Zenhaven. I think my favorite so far is a toss-up between the Zenhaven and GhostBed Luxe! I like the purple mattress best. I literally have at the moment a air mattress and this would be a dream! Lmao! Thank you for the chance ! The Idle mattress is my favorite latex mattress you’ve reviewed. The Aireloom Latex Collection is probably my favorite, it looks so luxurious! I love the reviews of the different mattereses and how they are with different body types, my type is 150 lbs over my ideal weight. so I would take this mattress if I won it, but I’m thinking the Satva might be better, as Springs might be my best friend for now. Thank you for offering so many people the chance to win! I like the Dream Cloud, it seems to be the better mattress for side sleepers. I wished I knew, without sleeping on them I don’t know. I would probably like almost any of the mattress you have reviewed but the Nectar gets my attention because it has been rated as one of the best for couples. My husband and I slepp completely different and I hate that my restlessness disturbs him so he doesn’t get good rest. I like the Nectar because of the memory foam. I’m a side sleeper so I think I’d like Nectar and I like that it keeps you cool. So far, the Zenhaven is my favorite LATEX mattress. However, the Nectar mattress sounds like a great fit for me & the hubby! Loving it!!!! I like The Ghost of Zenhaven.Honestly, they all look super nice and would have to feel much better than our old mattress. Would really love a new mattress! Sleeping on a 10+ year old one that needs to be thrown out in a bad way. I am not sure what you mean as “latex” since many of the mattresses you have reviewed are a combination of materials…that said. I like the purple, the nectar and the helix best. :-) Thank you. Definitely need a new mattress! Thanks for the chance! Please pick me to win! Zenhaven, is the one for me. But I like them all. It would be so nice to win one. Thanks for the chance. Thank you for a chance this would be amazing. Looks amazing, thanks for the chance! I like the name of this. Sounds sweet and maybe it means sweet dreams? Thank you for the opportunity to win! The Nectar seems to be a great option. The Zenhaven mattress sounds wonderful! They all seem pretty cool to me! This is an awesome warranty on the Nectar bed. I think whether I win or not, my next mattress will be from Sleepopolis! I’ve never seen some comprehensive reviews before. I am liking the Purple mattress. The Nectar Mattress has all the features I need for comfort and aligned,pain free sleep, at last. It has become my #1 choice! The Nector sounds amazing for side sleepers.I sleep on my side and have yet to find a good mattress for myself. I’m a side sleeper so the Zenhaven and Latex for Less mattresses sound perfect! Yes, I would love to win one. Then I could brag to everyone how great it is. I’ve been researching mattresses forever now, and this one seems like a good fit. I like them all but Nectar sounds like it would work, I toss & turn but ultimately wind up on my side. I like the Zenhaven but they are all nice! This would be sooo amazing!! Great giveaway thank you for the chance to win . Been having back pains and waking up several times from my current mattress. Would love to have Nectar and finally get a good night’s sleep especially after long work hours from the hospital. I’ve been reading your reviews and I just can’t decide between Saatva or Dreamcloud. They both sound wonderful and would love either one of them. It would be nice to finally get a good nights sleep. Nectar mattress is the best. Most comfy. It would be so awesome to win a new mattress. Latex for Less is my favorite mattress I like the fact that it is a flippable mattress. I really like the Spindle mattress. The nectar mattress is one of my favorites. I’d love to win one of them. Thanks for the awesome opportunity and chance. Any matress. I side 2ith nectar though. Alit if great reviews! Good luck! Thanks for the chance hoping to win one of these because regular ones are horrible its seems these new ones are they way to go. The Nectar Mattress sounds very comfy! To be truthful, any of these mattresses would be better than my matress. I have 2 ruptured discs at L4/L5 & L5/S1 they make it hard to find any bed worth a darn. On top of that the disc at L5/S1 is calcified and pinching off the nerves in my left leg. I do have back and neck issues so this is another good sidesleeper for me!! Zenhaven looks Awesome!!!! Thanks for all of the fun Sleepopolis!!!! Good Luck Everyone!!!! Zenhaven is tops in my book. I could really use a new mattress! Looks like a very good mattress. The Nectar sounds awesome! Hubby is a strict side sleeper and I switch between back and side. Thanks for the chance to win; fingers are crossed and this would be an awesome Christmas gift! Fave latex you’ve reviewed is a toss-up between Spindle and ZenHaven. Thanks for all these giveaways! Nectar – the name even sounds sweet! This nectar mattress sounds awesome! I would love to get one. Zenhaven is my favorite latex mattress. I like many of the mattresses. I am drawn to the Purple one! Sweet as Nectar ! Is for my choice ! Great info!! I own 2 Nectar mattresses already!! Best investment I have ever seen!!! Looking to upgrade to a queen. I’ve never tried an all memory foam mattress, although I’d like to as a side sleeper. I also do love the sinking in feel as opposed to the on top of. Would love to try the Nectar mattress! Late in the evening, but I’m still reading! Very nice I would Love this. The Hybrid one and the Avocado sound very nice but I would be thrilled with any of the beds. These mattresses sound amazing! I would love a good night’s sleep on one. This Nectar mattress looks amazing. I never knew that there were so many options in mattresses. I’m a side sleeper so my favorite would have to be the Zenhaven mattress. Thank you !! I hear it’s the best! Zenhaven is my favorite as described. This would surely be a dream come true. And yes all pun intended. I think I like the loom & leaf because it looks rich, comfortable and firm so that it would be easy to get in and out of..
As a side sleeping couple, we’d love to win this one! My favorite mattress is the Leesa mattress !! The Nectar mattress uses multiple layers of memory foam to provide deep pressure relief. It’s a great mattress that we recommend for side sleepers. It would help to relieve pain. Friend of mine has a nectar and says it’s great. My VA doctors say I need a new bed, but like many retired disabled, it’s direct deposit to direct deposit. My Bed is like 20 years old it was my mother and father’s I sooo need a new bed, A good new bed. Me and my husband both suffer from severe neck and back pain, I have to slip disks in my back that I need surgery for but scared to get it, finding the right perfect bed for us is NOT an easy task to do. My favorites are Nectar, Ghostbed and Purple. However, all your reviews on the various mattressess sound terrific and would be super comfortable. I like the GhostBed latex mattress. The Zenhaven is my favorite latex mattress. I would love to have a memory foam mattress! I have been wanting one for years. The Ghost Bed is my favorite! Almost bought one on Cyber Monday but just didn’t quite have it in the budget this year. Being a side sleeper, I love the sounds of the Zenhaven the most. I really love the sounds of the Luxury Plush configuration for it. Its so hard to pick a mattress I like best as there is something great about each one. I definitely like this Nectar Mattress though! My favorite, of the best latex mattresses that were reviewed, is the Spindle. I hope that I win, I am in desperate need of a new bed, as mine is nearly 15 years old and has a severe dent in the middle that aggravate my hip, neck and back issues. I finally broke down a few days ago and bought a smooshy dog bed to fill in the dent! Fingers crossed! I’m a side sleeper, so a Nectar mattress would be awesome to win. And I interested in the memory foam construction of the Nectar mattress. I’ve always wanted a Nectar. I need a new mattress. My old one was brought in 1990. Hoping. The ZenHaven sounds the great! I love the memory foam. It is so helpful with tossing and turning. Between the Casper and Purple and Nectar, I would have to go with the nectar but not sure if that is a latex? My hubby and I totally need this! Thank you for the chance! Love the Nectar! I’m a side sleeper. The Casper has my heart!!! But I would love any of em. I would love to win any of the mattress. but if I would have given a chance to pick one then I’d pick Zenheavan latex mattress. Yes… I live the new Nectar mattress.